While looking through the postcards for the Our Town series of posts, I came across this little beauty. As this is the 100th running of the 500, this seemed like just the thing for a Memorial Day weekend post. 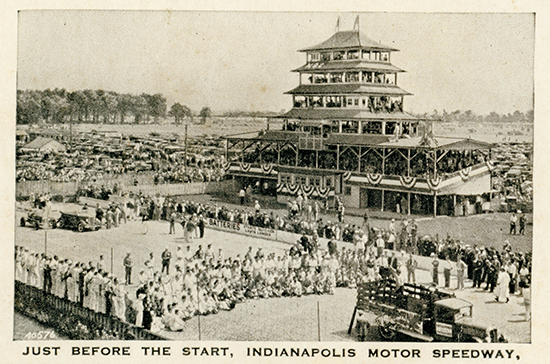 What I especially love about this is the undeveloped nature of the track and the Pagoda as it was originally built. It was one of four little cards which were a gift from Dave And Bonnie Downs, the great-grandchildren of our President Joseph F. Tuttle. The cards are 3.5″ wide and only 2.25″ tall and are part of a set. The other cards are of James Whitcomb Riley’s home, the Indiana State Capitol and the St. Vincent Hospital on Fall Creek in Indianapolis. The great blog Historic Indianapolis says that the building was opened in 1913 so the post cards are at least that old. Here is a link to a very nice piece on the old hospital. I hope that you all have a lovely Memorial weekend and enjoy the race!